All group bookings are final. No refunds will be offered for cancellations, no-shows or reduction in numbers. Additional services may be available depending on the groups needs. Additional services may include: prepared meals, custom activities, rental equipment, etc.. All additional services are priced per group. Please contact us for pricing. International Traveler’s House was founded to create memorable, authentic and unique experiences for travelers. We do this through connecting our guests with local culture, neighborhoods and adventures. At our hostel, we have a passion for community and love to bring travelers together to explore the city and make memories. We start everyone’s day with a complimentary breakfast and advice on amazing activities to showcase our beautiful city! 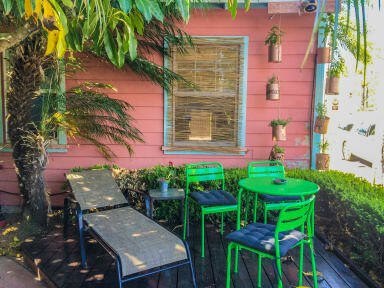 Conveniently located in Little Italy for travelers looking to enjoy the action of the Downtown San Diego nightlife. Amazing restaurants and popular bars are all within walking distance. Travelers can easily access all of San Diego’s top activities. The external floor plan offers lots of outdoor space to meet other travelers. Inside the building, guests can enjoy a variety of lounge spaces to relax or work from. 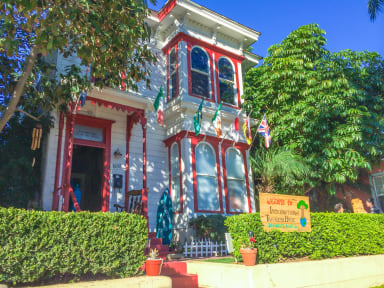 The unique design of our historic Victorian building creates a social, friendly and fun atmosphere. Hosted social events happen every evening for guests to connect and meet other travelers. The property is designed with various buildings so that each traveler can choose the best room type for their travel needs. We have several room options, including Bungalows, female only rooms, dorm style rooms, private rooms and business traveler rooms. All rooms have been equipped with the latest bed designs, giving you a comfortable night sleep. We also have free Wi-Fi and iPads for guest use. By staying at ITH, you become a part of a community dedicated to creating global, cultural and community centric sustainable relationships. You are also supporting the sustainable measures we strive to implement in each of our hostels. For example, we grow organic vegetables for you to enjoy, upcycle furniture into art and integrate recycling and composting programs. Being a guest at ITH is an experience. We offer a variety of rooms types so we can share this unique experience with as many travelers as possible. Great for single travelers or groups. Please note that guests staying at ITH must be over 18 years. International guests with a valid passport and American travelers that reside outside of San Diego County are welcome. Must show proof of onward travel. THIS PLACE IS AMAZING! Anyone that has the ability to stay here, should! The staff is so welcoming and so are all the guests staying there. The location of this hostel is amazing! I can’t say enough about this place and I will be back. The staff are supper friendly and helpful. I love the vibes of the hostel a lot! A great stay in this hostel. Will definitely come back next time!!! We stayed in the garden house. It was quiet and comfortable. There was plenty of hot water in the showers. Staff provided clean towels, and the place was very clean. I really enjoyed the breakfasts that we had. There were eggs toast cereal mashed potatoes and pancakes. The location is great, walking distance to most downtown sites of interest. The hostel staff is very friendly. Everyone is friendly and open, we enjoyed watching the American football game as well as the gift exchange for Christmas. I didn't get to see the other buildings, just the main house. The guests can get a little loud but the bed was SUPER comfortable (and there is a self-serve earplug station for light sleepers). There is an ATM in the hostel. The check-out process is very easy. Not a well furnished or super clean hostel. However, it’s a super cool and stylish. I never felt so welcomed in other hostels. People here (staffs and guests) are just so nice. A lot of people know each other. They are very talkative too. There also exist daily activities. I am sad I didn’t join them in the day time, but I do enjoy the free drinks at night. Also really near train station and my TOEFL exams venue (two blocks away). Great place only a couple of bugs. It's downtown, which I'm not a fan of but it was close to little italy which was nice! They offer a delightful pancake breakfast batter, w/ chocolate chips, cinnamon and freshly sliced bananas to add. The check in guy even upgraded my room for free when I inquired about quiet hours! Room wasn't clean on arrival. We had to wait for bedding to be changed and the deep clean promised for the next day never happened. Staff didn't help carry luggage up flights of stairs. Private room was good sized with plenty of storage. No hand soap in the shared bathroom. Communal hand towel didn't look the cleanest. I'd consider staying here again but I'd probably give another hostel a shot first. The door to our room didn't lock. The free breakfast for both days was actually just pancake batter. The room we stayed in had not been properly vacuumed or dusted for some time. The shelf next to the bed was hanging off the wall and the light fixture was broken. No easy access to sockets at the beds. Several insects in the room. Bathrooms don't look like they are cleaned regularly. Great location. With a bit of maintenance and organization it could be a top hostel.